“As they approached, Jesus said, ‘Now here is a genuine son of Israel—a man of complete integrity.’ ‘How do you know about me?’ Nathanael asked. Jesus replied, ‘I could see you under the fig tree before Philip found you.’ Then Nathanael exclaimed, ‘Rabbi, you are the Son of God—the King of Israel!’ Jesus asked him, ‘Do you believe this just because I told you I had seen you under the fig tree? You will see greater things than this.’ Then he said, ‘I tell you the truth, you will all see heaven open and the angels of God going up and down on the Son of Man, the one who is the stairway between heaven and earth.’ ” (John 1:47-51, NLT). Almost all the words spoken by Jesus and recorded in the Gospels quote Old Testament Scriptures or make an allusion to an Old Testament story or event. That is the case here with the calling of Nathanael as one of Jesus’ disciples. Jesus referred to Nathanael as a man of complete integrity–that is, an Israelite in whom there is no deception or deceit. By describing Nathanael in such a way, Jesus contrasted him with Jacob, the scheming, deceitful patriarch whom God renamed Israel. When Jesus said He saw Nathanael under the fig tree, maybe praying or studying the Scriptures, Jesus revealed an intimate and supernatural knowledge of Nathanael. Then Jesus made the comparison with Jacob personal and unequivocal. Like Jacob, Nathanael would see God at work. 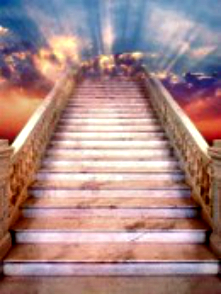 In Genesis 28:10-22 Jacob had a dream in which God revealed His angelic host going up and down a stairway or ladder from the earth up to heaven. God stood at the top of the stairway and proclaimed to Jacob that His presence would be with Jacob and protect and provide for him and his descendants. So Jacob named the place Bethel, meaning house of God, the place where God lives. Jesus proclaimed to Nathanael that He Himself was the ultimate fulfillment of this promise to Jacob. Jesus was the true ladder or stairway to heaven, the new Bethel. God opened a door for Jacob that brought him and his people into a new relationship with God and Jesus was doing the same for Nathanael. Nathanael recognized the divine in Jesus and took a remarkable step of faith and believed in Jesus as God’s Son and Lord and King over Israel and consequently over His life. In the same way that Jesus knew Nathanael and called him to be His disciple, Jesus knows you personally. And, He is also calling you to be His disciple. Jesus is the stairway to God that Jacob observed at Bethel. And, the place where you meet Jesus is the place where you will start your climb up the stairway to heaven. This entry was posted in Old Testament, salvation, Savior, Son of God and tagged Bible, Israel, Jacob, salvation, Son of God. Bookmark the permalink.